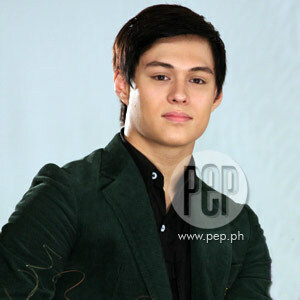 Young actor Enrique Gil does not mind if he is only a replacement in the upcoming movie of Star Cinema titled Way Back Home. The 19-year-old actor said he didn’t have an idea about being the second choice to play opposite Kathryn Bernardo in the family drama movie. "Siyempre, super happy po. Super thankful po ako na kami po ang napili," said Enrique during the press conference of the movie last night, August 3, at Dolphy Theater, ABS-CBN compound in Quezon City. He added, "Nagpapasalamat ako na nangyari ’yon. Actually, nagpapasalamat ako sa Star Cinema dahil ako ang naging choice nila, ’yong pumalit kay Albie." Enrique was also referring to his Good Vibes co-actor Sam Concepcion. Sam was asked to play the role that was supposedly for the late young actor AJ Perez. Meanwhile, Enrique was quick to clarify that he did not mean to be happy with what happened to the original selection. He explained, "Hindi ako nagpapasalamat na may nangyaring hindi ko alam or hindi siya [Albie] natuloy, na ako ’yong pumalit. "I’m just thankful sa fact na ako ’yong pinalit na gumawa [nitong pelikula]." NEW LOVETEAM PARTNER. On Way Back Home, Enrique will be paired for the first time with fellow Star Magic talent Kathryn Bernardo. Unlike other new screen partnerships, the young actor did not feel uneasy about being paired with the 15-year-old actress, whom he worked with for a while in the defunct teen musical variety show Shoutout!. He related, "Tulad ng iba, siyempre first time makatrabaho, nangangapa pa kayo. Pero sa kanila, okay naman. Walang pressure."